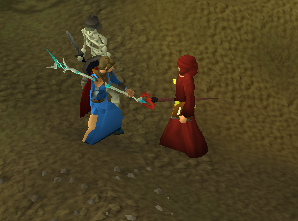 Begin by speaking to the Zamorak Mage located northeast of Edgeville, at the end of the River Lum. 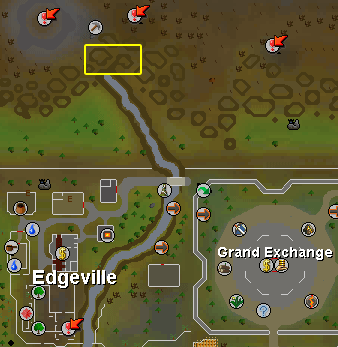 First off, follow the river east of Edgeville to the north until you find the Zamorak Mage. Try speaking to him while not wearing any Guthix or Saradomin items and he will tell you that the Wilderness is not a safe place to talk. He will tell you to go to Varrock. A bit south of Aubury's Rune Shop in Varrock is an Chaos Altar and a small church for Zamorak. You will find the Zamorak Mage there, and he will now be willing to speak with you in the safety of the church. Speak with him and he will want you to do a small task for him. At first, he would like you to give him the teleportation spell to the Rune Essence Mine. However, only a handful of individuals in RuneScape know the spell, and you are unable to help him. However, he believes that you can still help by gathering information about the spell's teleport locations. He gives you a Scrying Orb to collect data from the spell, and requests that you teleport to the Rune Essence Mine from at least three different locations. Aubury - East Varrock Rune Shop. Wizard Sedridor - Located in the Basement of the Wizard Tower. Wizard Distentor - Found in the Magic Guild. 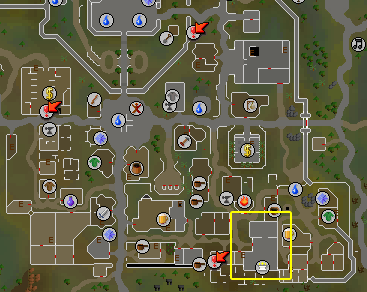 Wizard Cromperty - Located just northeast of the Ardougne Market. Brimstail Gnome - Found in a cave in the southwest corner of the Tree Gnome Stronghold. Tip: You only need to teleport to the Rune Essence Mine. You do not need to mine any Rune Essence. Once you have teleported to the Rune Essence Mine from three unique locations, your Scrying Orb will be completely green. Bring this back to the Zamorak Mage in Varrock, who will take it from you and begin investigating the data. Speak to him again to receive your rewards. Another danger of the Abyss is that it's a multiway combat zone where players can attack each other. Please see the Abyssal Space guide for more information on this area. The various Pouches allows you to carry Rune Essence inside. There are 4 different sizes, each able to carry a different amount of Rune Essence. You can only carry one of each kind of pouch at a time, and the other pouches are sometimes dropped by the Abyssal Creatures.